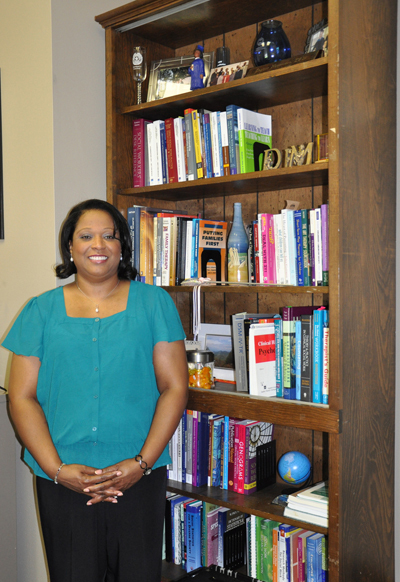 While social work was actually not her first choice of study, apparently it was the right choice for Dr. Daphne Henderson, an assistant professor of social work. She first considered occupational therapy and psychology, but went on to earn a Bachelor of Social Work at Texas A&M University-Commerce, a Master of Science in Social Work and doctorate at University of Texas at Arlington. She is a licensed master social worker. 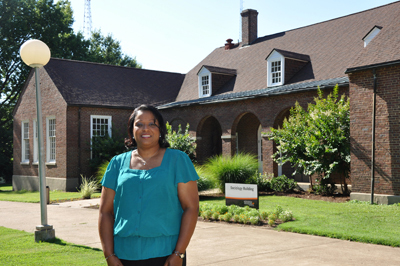 A native of Dallas, Henderson joined UT Martin in 2010 after serving as assistant professor of social work at East Tennessee State University for four years. She began her teaching career at Eastfield Community College in 1999 and also was employed at her alma mater, Texas A&M. Her husband, Joe Henderson, is UT Martin student conduct coordinator in the Division of Student Affairs. The couple has three adult children, Egypt, Brittany and Ryan. Brittany is a senior at UT Martin. “From the beginning, I wanted to work in a helping profession, and social work allowed me to work in numerous settings with diverse clients,” said Henderson. Henderson said social work is important because of its very nature, which is to help improve the quality of life for anyone needing assistance. That assistance can help address family problems, medical issues, inadequate housing, unemployment or substance abuse. Social workers can advocate for new and improved service, as well as policy planning and development. And although social work pre-dates the 1900s, she added that many still question its legitimacy, making licensing a valued element. “Licensing not only legitimizes social work, it also separates it from other helping professions,” she said. The social work field has changed since Henderson began her career – all because individuals, families, groups, organizations and communities have changed. Those changes in society dictate changes in social work, she said, and a primary goal of social workers is to be effective change agents. Schools, hospitals, prisons and social-service agencies will likely employ her students. Henderson has the advantage of her own “real-world” experience to help her students prepare for their careers. Prior to teaching, she worked in mental health, medical and child-welfare settings. She enjoyed her time working in the child-welfare system. “I had the opportunity to work with children who had been removed from the care of their biological family. Being forced to leave the familiarity of home, even an abusive home, can be scary and traumatic,” she said. “One of my responsibilities was to ensure that each child received the best possible care, which included encouragement, support and being a constant presence.